This Symphony in C minor was composed in 2015 and is written in a style of the Romantic period of the 19th century. The first movement begins with a dramatic entrance by the full orchestra which is reminiscent of Beethoven's later works for orchestra. The shadowy main theme contrasts with the more lively second theme in G major and the music of the development section of this movement bears some resemblance to the early symphonies of Antonín Dvořák and Richard Strauss. The second movement is marked "Adagio" and begins with a slow, stately theme played by the low brass, the clarinets and the bassoons. In this movement many stylistic influences of Anton Bruckner and Dvořák can be heard, especially in the orchestration and the structure of the whole movement. The third movement is marked "Scherzo" and is written in two-four time. Echoes of Johannes Brahms and Franz Schubert are present. The dramatic "Finale" to the Symphony in C minor brings the work to a resounding end. After an impressive, grandiose introduction (Largo), the movement at first quietly moves into a fast-paced Allegro in three-quarter time before bursting into an imposing tutti with the full orchestra. Finally the introduction returns to introduce a satisfying conclusion in the Romantic style of Beethoven and Schumann. 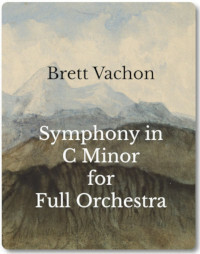 If you are interested in seeing the Full Score of the Symphony in C Minor you can visit my issu page. In October 2017, I had an opportunity to hear this work live for the first time. The Quinte Symphony Orchestra, an amateur orchestra under the direction of Maestro Dan Tremblay, performed this work at a world premiere concert in Belleville, Ontario. Here are the videos from the world premiere.